The oldest part of the unique collection of the Mauritshuis in Den Haag consists of paintings that used to be owned by stadtholder Willem V, prince of Oranje-Nassau (1748-1806). Willem started collecting art at a young age. In 1774, he created a gallery for his collection of paintings at the Buitenhof in The Hague. He opened the gallery a few times a week to (properly dressed) visitors who would have to purchase a ticket for it. This makes the Prins Willem V Galerij the first public art collection in the Netherlands. In 1795, the collection was taken to Paris as spoils of war by Napoleon’s troops, and exhibited at the Louvre. It was only 20 years later, in 1815, that the collection largely returned to the Netherlands. In 1816, king William I (1772-1843), the son of stadtholder William V, donated the collections of his father to the Dutch state. In 1822, because the exhibition space became too small for the growing collection, ‘Het Koninklijk Kabinet van Schilderijen’ (Royal Picture Gallery) moved from the site on the Buitenhof to the then available Mauritshuis, on the opposite side of the Hofvijver. From this moment on, the Mauritshuis became a proper museum, together with the Prins Willem V Galerij as its origin as well as satellite around the corner, which still can be visited in its recently restored formal glory. On the walls of the Prins Willem V Galerij, the most prestigeous and by far most beautiful exhibition space in Den Haag, amongst all the masterpieces on the walls one can find quite an intriguing painting by Caesar van Everdingen (1617-1678), who was a Dutch portrait and history painter of an outstanding quality. 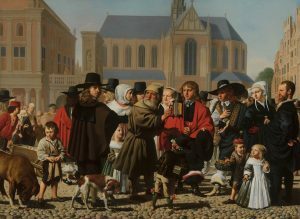 This unusual both history as well as group portrait painting is one of the most remarkable he ever made.